Grandma's Knitting Place: Biscuits and Bones Dog Coat Finished! Well that didn't take long!! Once I had worked out the pattern directions - which were written in a weird way IMHO, it only took about 10 hours to make. My hand is sticking out of what will be the turtle neck, and the little cuff showing is a leg hole! The pattern was a Patons one for Canadiana/Classic Wool/Decor; but there were four sections or panels of pattern block, and you had to do 1st row of panel one, followed by first row of panel 2, etc etc all on one row - as well as keep referring back to a gazillion types of cable abbreviations. So I rewrote and test knit the whole thing so that it is so much easier to understand and follow - I do not need to have to keep chasing backwards and forwards over a page like that to find the directions. Now that I have done this one - I shall be able to repeat these in my sleep - and it comes in four sizes which is very handy!! It is so cute - biscuits and bones is the right name for it!! For once I have nothing else demanding my time (knitting wise that is) so Sandee dear - yours is about to be started at long last! It is crochet this time - a nice change!! Wonder if it will be the original pattern that she ends up with LOL??? I never seem to leave a pattern alone, without tweaking it here and there!. Wonderful dog coat. I have a whippet so I'm not sure if there is a size or shape to fit him. The many sweaters you've done are impressive. Do you donate most of them to hospitals? I LOVE this little doggie sweater! My grandmother is looking for a nice project to do...and I thought she could make this sweater for my Jack Russell and my Pitbull (a BIG version of it!). Anyway, I tried registering to Paton's and I still can't seem to get the pattern. Could you perhaps email me your revised pattern? Thanks! I would love the pattern for the Whippet dog coat. can the pattern be e-mailed to me? You did a beautiful job on the "biscuits and bones" dog coat. I too am attempting to decipher the pattern. Would it be possible to get your revised pattern. I would greatly appreciate it. You did such a beautiful job on this sweater. I have tried to work with this pattern twice and have been unsuccessful. Would you be willing to share your revised version with me? I too have a grand-dog RT named Toby who spent many months with my daughter and son-in-law in sunny San Diego (he's in the Navy) and now is with us in the colder Northwest. He'll be needing a nice warm sweater for our daily walks. This one looks great! Would love having a copy of your revised pattern if possible. Thanks so much! beautiful job on the "biscuits and bones" dog coat. I too am attempting to decipher the pattern. Would it be possible to get your revised pattern. I would greatly appreciate it. I too am attempting to decipher the pattern. Would it be possible to get your revised pattern. I would greatly appreciate it. Hi! Great job on the doggie sweater! I am making one for my dachshund and am just getting to the "armhole" part. The instructions have me confused. I would be so grateful if you could share your revised pattern with me! Thank you so much. Marcy I would love to send it to you - if you could send me your email address??? You have an anonymous profile so I can't help you out !! Biscuits and bones was abosolutely gorgeous, the color is smashing! 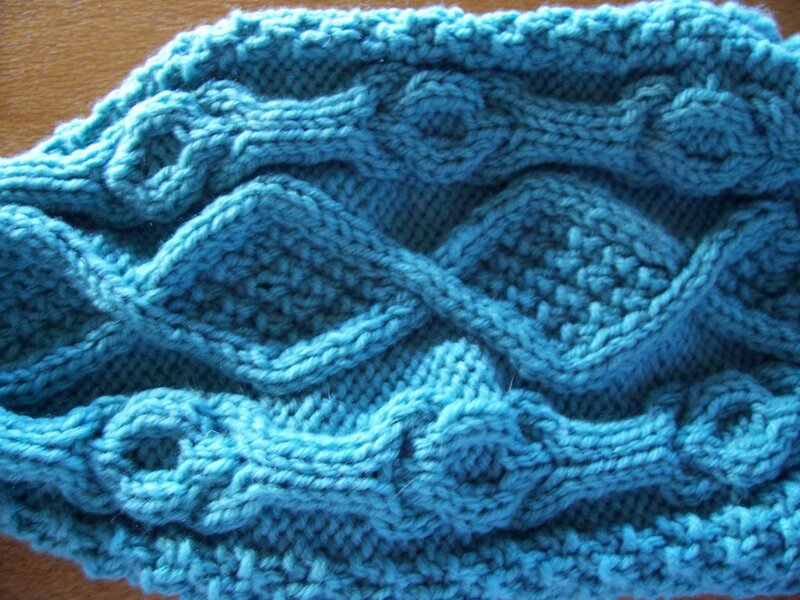 I was looking at that pattern yesturday, thinking "I wonder if I can convert it to crochet...". If you wouldn't mind, may I have a copy of your revised pattern? WOW... I thought I was not reading the pattern properly!!!! 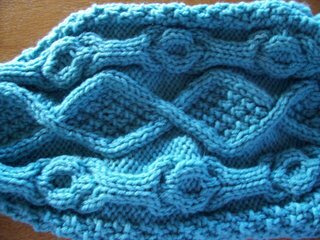 I have tried 4 times to knit this, and each time I have gne dreadfully wrong. Could you please, please post me a copy of your simplified version of the pattern, It is my only hope. I've been trying to do this one as well, and I'm doing so-so, just getting stuck a lot!! Did anyone successfully receive the rewritten instructions? I would SO love to be able to finish this sweater and make another!! Your sweater is just beautiful. I'm looking for something for my friend's new 3 pound Yorkie. We would really appreciate it if you could forward the pattern. I would love to send you the revised pattern - but I don't have your email address - please let me have it and the revised pattern is yours! I was so frustrated with Paton's site and wanted to download this pattern because I can't find my original copy. I thought it was me and I too tried it several times and it is very confusing. Came across your blog about this sweater and see that you have revised the pattern. Would you still be willing to share it? I would so appreciate it as having seen yours has motivated me even more! k3n I would love to send you the revised pattern - please let me have your email address? As soon as you contact me with an address to send it to - it is yours! flowers_for_evadne@yahoo.com? 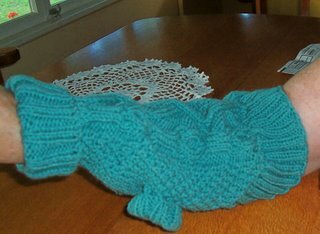 I would appreciate it so much-this silly sweater is a gift for my mother in law's dog and I know she would love it! Thank you so much! I have been looking for a coat pattern for my daughters 'new baby', a yorkshire terrier. This revised pattern for the cable sweater seems so popular,I would love to make this for him for Xmas. I have been trying to figure out this pattern too. I'm not sure I understand some of the abbreviations they are using either. Could you send me your revised pattern? I would be so greatful!! CR I would love to send you the pattern - but you didn't leave an email address! contact me and include your email address and it's yours. Yvette, I still have not received your directions for the biscuits and bones dog coat. My email is crubel@comcast.net. Thanks so much for sharing! Yours looks beautiful and I can't wait to make one! You really did do a beautiful job on this sweater. I too would like your revised pattern if that is possible. Thank You for posting this fabulous sweater! I know this is 2011 October - but is it still possible to get your re-written pattern? I know this is October, 2011 - but is it still possible to get your re-written pattern. I am trying, and wonder if there is a mistake in Paton's version. 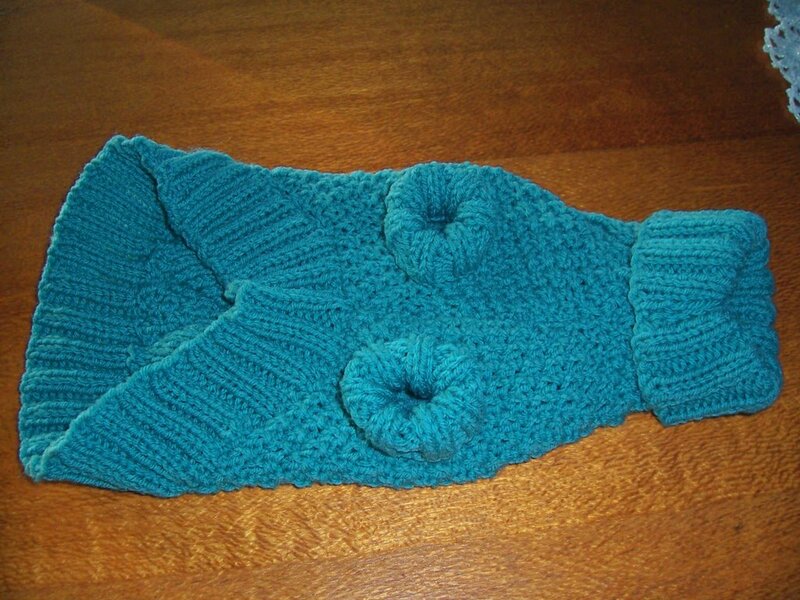 I have been trying to knit this beautiful little sweater and I have come to a stand still. It is so frustrating. Would you send me a copy of your version? I would appreciate it so much. Yvette, I'm in the same boat as apparently everyone. I'm not a very experienced knitter, but I really want to make this pattern for my pup. I've had it for a couple of days, but am completely lost. I know your blog post is quite a few years from today, but I am hoping you might still have the revised pattern you made. I would love to have the revised pattern if someone could send it. coolgram36@gmail.com. Thank you! Did you ever receive the revised pattern? I know it has been a while ago, but I would like to get a copy, coolgram36@gmail.com. Thanks!